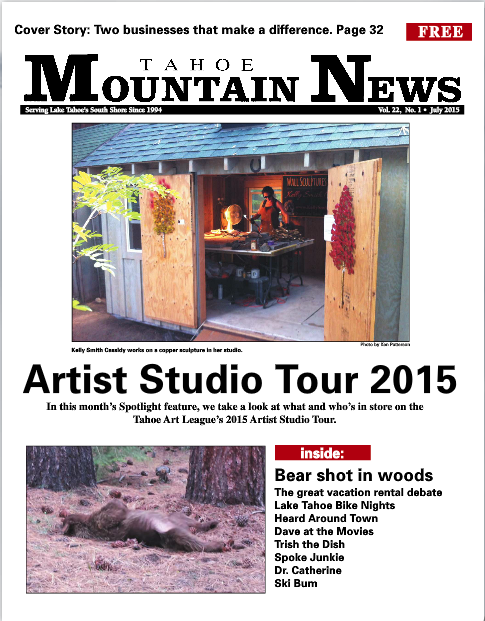 In July 2015, I wrote an article for Mountain News in South Lake Tahoe about the Tahoe Art League's AnnualStudio Tour. If the photo looks familiar, you are right; the editor chose a photo of my studio to feature on the cover. 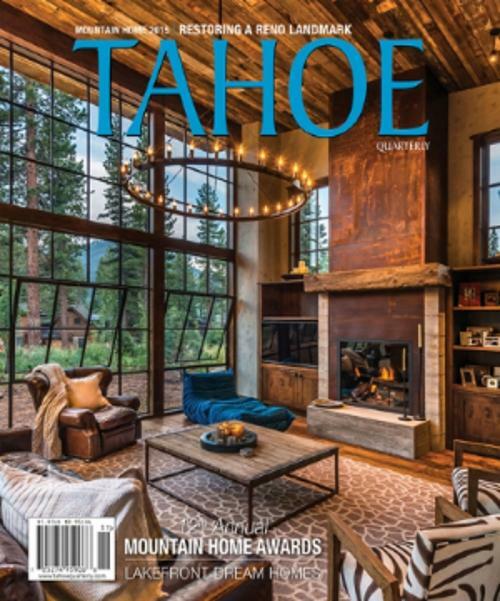 Here is an article that was written about me and my art in the summer 2015 edition of the Tahoe Quarterly Magazine. You can imagine my shock and exhilaration when I received the phone call asking if I'd like to be interviewed! Check out the article here: "Taking Up The Torch"
An article I wrote for the Puma Press (Phoenix, AZ) about starting out in the art business. Author Kelly Smith with her father, Richard Bell Smith, in her art booth, Breckenridge, Colorado. August, 2009. In today’s economy, who isn’t afraid to start a new business? There are newscasts of failing businesses, mergers, lay-offs and fledgling businesses that have all the best intentions going in only to fail before the doors even open. But I can tell you being a professional fine artist for 13 years now; I know that the art business is alive and well. By the time I was 8 years old, I was already selling my parents work in their galleries and at art shows. During the summer season, we lived on the road, traveling from show to show. Packing and unpacking the car became an art in itself. There was no better way for me to learn about communications than to sell art. I met people from all walks of life. I was able to tune into the most minute of gestures to know whether or not a customer was interested in a piece. At 16, I sold my first piece that I created for $100. I was hooked. Selling my own art became a whole new game. Over time, I learned how to float over the turbulent economic waves. And along the way, I have gained a reputation for helping other artists also weather the storms that send many other artists crashing into the shore. Even in this economy, there are still people who desire and buy fine art just as there are people still buying other luxury items such as fine cars and trips around the world. If you have ever thought about starting a fine art business, I would suggest you not let the current economic trends deter you from your dreams. I will show you simple tips in order to help you lay all the necessary groundwork to start you on the road to success in the art world. First things first: you must evaluate your work in the most honest way possible. How do you do this? The best way I have found is to ask yourself if you would buy your art if you saw it in a show or gallery. Then, ask your friends, family and perhaps a few art aficionados what they think of your work. If they are honest and you have stated your own reasons in a good-natured way, the least that could happen is that you will receive some great advice from those who are in the know on how to improve until you feel the work is up to selling standard. Never let one person’s opinion deter you. There is a buyer for every work possible. After careful evaluation, it is time to price your work. Pricing is never easy for the new artist. But one thing is for sure: you must NEVER undersell yourself. It makes your work look cheaper than it is. Check the local market and see what similar styles and sizes of pieces in your medium are going for. For paintings and photographs, the general rule is to mark your pieces per square inch. For sculpture, a good rule is to take your casting or material costs and multiply them by three or four as your retail base. Sally, a painter from Scottsdale, was excited to show me her newest paintings and obtain my opinion. She was happy about her work although she could not understand why she had not yet been accepted by any galleries. She opened up her phone and went to her photographs. On the tiny screen were photographs that looked as though they were done with a disposable camera or on the camera phone itself. I asked her if I could see her paintings in person. When I saw her huge abstract paintings, they were as unique as they were beautiful; I was shocked. I sent her to find a good photographer. There was no way that she should spend another minute having representatives pass her by. A photograph of your work will literally make or break you in the art business. I have known many talented artists whose work was continually rejected from shows and galleries due to poorly taken photographs. If artists don’t care about representing their work in the best possible way, why should an artist representative care? It pays to invest time and money in having professional quality photographs taken of your work. Nothing says “amateur” more than poor quality photographs. If you are on a tight budget, check Craigslist.org for photographers looking to expand their portfolios for a small fee or even for free. If you are doing the photography yourself, learn how to create a light box from simple materials such as shop lights and white sheets to get the best out of your home equipment. Treat these photographs with care. They are your ticket into the art business. If you want to enter art shows and festivals along with gallery representation, format your photos on a computer using Photoshop (you can download Photoshop for a month for free online: http://www.adobe.com/downloads/, so that they have a 1920 x 1920 pixel ratio. Most art shows and festival organizers now use this format when judging work for show jury. You can sign up for “Zapplication.org,” an online art show and festival submission site for free and have access to hundreds of shows that use Zapplication to review and choose artists for their shows. There were several times when a nervous artist would walk into my parents’ gallery and ask to show their portfolio in the hopes of showing their work. Every time, my parents were kind and patient and would talk to an artist about his or her artwork. They gave advice on everything from technique to people skills. I learned so much from watching my parents communicate with patrons and artists. Over the years, I gained a reputation for having an “eye” for artwork, and I have had many artists ask if I would see their work. Most of them had never tried to approach a gallery or knew what it entailed. Well, here is the best tip of all: the gallery owners are people too. When an inquiring artist genuinely connects with gallery owners, the gallery owners become disarmed and are more apt to look sincerely at their portfolio. Every gallery has artists coming in asking about how to submit their work. You will first want to make sure that your art “fits” into the style represented by the gallery, so do your research. In this computer information age, there is no excuse for not doing some investigating before you approach a gallery. Once you are sure that your work will fit into the gallery, visit the gallery and ask about the submission process for new artists. Typically, the submission process includes a portfolio viewing and personal interview. Often times, a gallery representative will have a sheet outlining how to submit your work. Other galleries may give you the card of the owner or manager, and then it is up to you to proceed and connect with the person in charge. On rare occasions, a gallery owner may be in the gallery. In this case, and if there is no submission protocol, ask if you may show the gallery owner your portfolio. Don’t be shy. After all, if the gallery owners like your work and accept you into their gallery, they will need you in order to make money. Never underestimate or apologize for your work. Simply allow your work to speak for itself. The owner will undoubtedly ask your selling price at this first meeting. This is the retail price you set for your pieces. The gallery will be taking a commission of half of the retail price on the sales of your pieces. Never settle for less than this for your cut. When you are better known and selling regularly, you may either renegotiate the percentage or raise your retail price. A very good rule of thumb is to have EVERYTHING in writing. Create your own consignment sheets to protect yourself. And if the gallery asks for exclusive rights in a region, be sure they fully disclose the agreement with you. If the gallery is not selling for you, you may want to reconsider the exclusivity of the gallery or move on. I have always known that art cannot sell itself. As artists, we cannot hide away in some dark cocoon of a studio and expect for art dealers and buyers to come knocking at the door. We must go to them up front, center and available. The best possible way for artists to wet their feet is to do the art show circuit. Even the most seasoned and talented artist will still do the art shows and festivals. I know of many artists who will sell to prestigious art galleries as well as do a few shows in a season where they can sell their work at full retail value. Many art show guides exist, such as the “Sunshine Artists Catalog” that lists every show in the United States according to date, type, region, state and rank. I use Zapplication.org to find, sort and apply to shows. There are a few shows that are not listed on Zapplication, and I would suggest doing some research online to find the best shows for you. Here are a few simple rules when it comes to the art show life. Have a reliable work truck or van. Invest in ‘ProPanel’ display walls for wall art and lightweight but classy pedestals for table pieces. Buy a good 10-square-foot display canopy (always white is the rule). My favorite brand is called Light Dome. Never sell more than 10 to 25 percent below your galleries that represent you retail price unless you are far away from the region where they sell. If you have no gallery representation, you can price and negotiate as you wish. Make it clear with the galleries who represent you about the “rules” on showing in their area. The untold but “known” rule is not to do art shows inside a 50-mile radius of any gallery that represents you, but I have had major clashes with galleries who would say that the rule is 50 miles only to turn around and tell me that I cannot sell anywhere in the entire state. This goes back to the rule of having everything in writing. Have at least 500 business cards on hand at the start of every show. Make it clear whether or not you accept credit cards. I have lost many sales in the past because the customer did not think I took credit cards because it was not posted somewhere in my booth. Keep a Guest Book of all interested customers. Encourage them to leave their contact information. After the customers leave the booth, write down as much description about them including any information about their style, what pieces they were interested in and any other pertinent information. 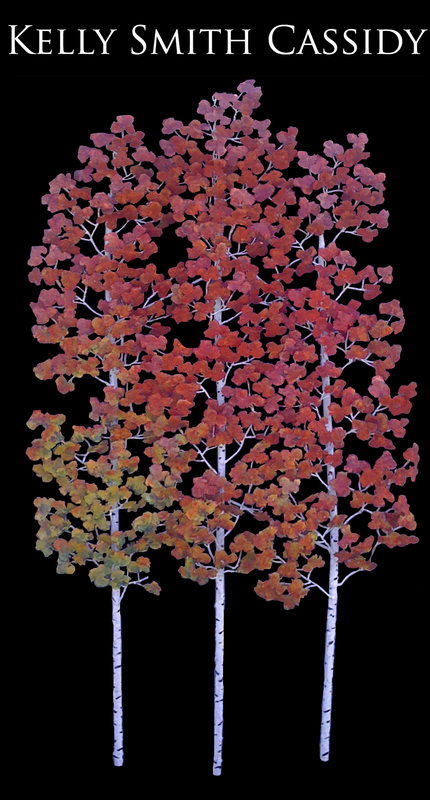 This is very helpful when creating a customer listing in such data-bases as InFile or sending out invitations and photos of new pieces that may fit their needs. I can tell you first hand that the art business world is exciting and generous. Not a dull day goes by. I am forever grateful that I am able to take my career by the reigns and steer myself into my own future. Wherever I go, I know that I can find an outlet for my art or even move to the middle of nowhere, make my art and then go and sell it. It is very gratifying and rewarding work although I no longer really see it as work. Two more pieces of advice I’d like to leave with you: never stop producing…and have fun.